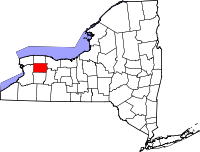 Established in 1802, Genesee County is located in the Adirondack Mountains region and has a large amount of hilly and forested areas; its name, in fact, is derived from a Seneca Indian word that means "the beautiful valley." The county seat of Batavia, NY, was one of the first settlements in the area and is home to the County Clerk's office as well as the Research Library and Records Management Department. The latter has a large variety of records on file including naturalization records from 1849 to 1929, Genesee County Federal censuses from 1810 to 1880, church and obituary records, and much more. Staff is on hand at the library to assist researchers in locating specific records and documents. Each town within Genesee County has their own local historians, as well, and a page listing them all, as well as their addresses and contact information, is provided via the historian's page of the main county website.